When getting a new body piercing, it is important to know what material you are getting pierced with. The body jewelry market is constantly growing with new designs and materials, and while many pieces may catch your eye when planning out you next piercing, not all of them are safe for your initial piercing or, for some, even long term wear. Over the next couple weeks, I plan on providing a basic look into various materials that are used in body jewelry, what the advantages and disadvantages of them are, and a brief explanation of how to care for each of them. This week I’m just going to go over two of the most common materials: implant grade surgical stainless steel (SS) and implant grade titanium (Ti). Now, I’m not an all knowing expert of all things related to body jewelry, more of an obsessed enthusiast; so remember that this information is just the tip of the iceberg, there’s always more to learn. 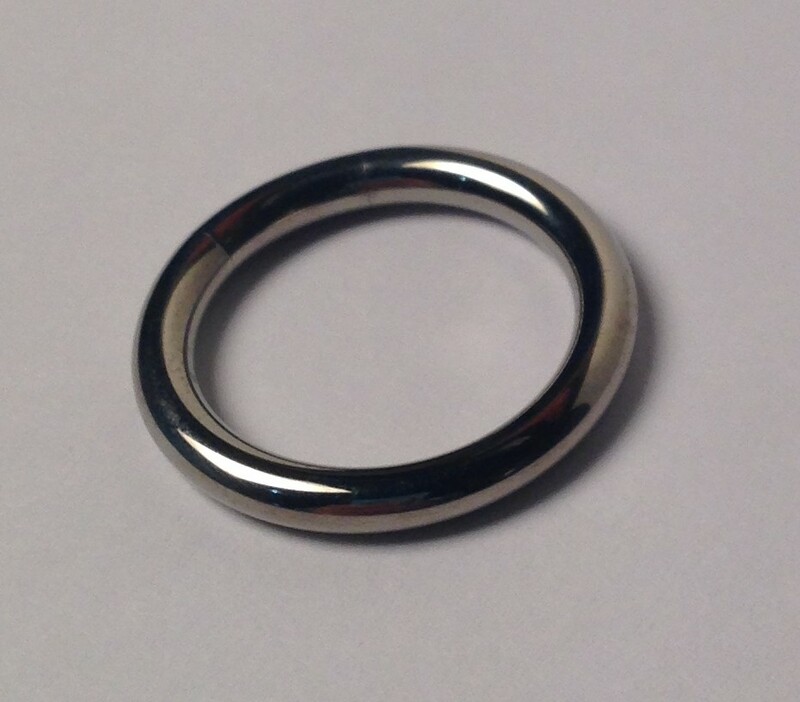 An implant grade 316LVM captive bead ring from Industrial Strength. What do these questions even mean? Well, “implant grade” is a term that means the metal is biocompatible, or “not harmful to living tissue, especially of materials used in surgical implants”. This is extremely important because your body piercing jewelry is going to be going through your tissue and remaining there for an extended period of time, it is important there are no negative reactions to the skin. So in the case of surgical stainless steel, 316LVM ASTM F138 is preferred because it is vacuum melted, a process that reduces outside contaminants and reduces inclusions within the metal. This doesn’t make it necessarily “better” than 316L ASTM F138 surgical stainless steel, especially if you have a nickel allergy or sensitivity, but it reduces possible irritants for your healing piercing making it more ideal for a worry free process. So even though they are implant grade, both 316L and 316LVM ASTM F138 Implant Grade Surgical Stainless Steel do contain nickel; the steel is alloyed with nickel to give it its stainless, or noncorrosive (rust resistant), quality. However some people do have a nickel allergy that causes their body to have a negative, irritating reaction when it comes in contact with nickel containing metals. 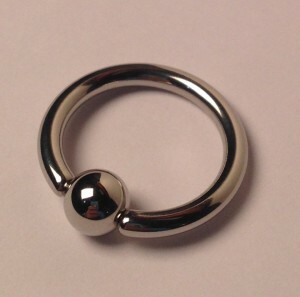 In cases such as these, surgical stainless steel should not be used for the initial piercing. An implant grade titanium segment ring from Anatometal. But fear not, victims of nickel allergy, for there is Implant Grade Titanium! 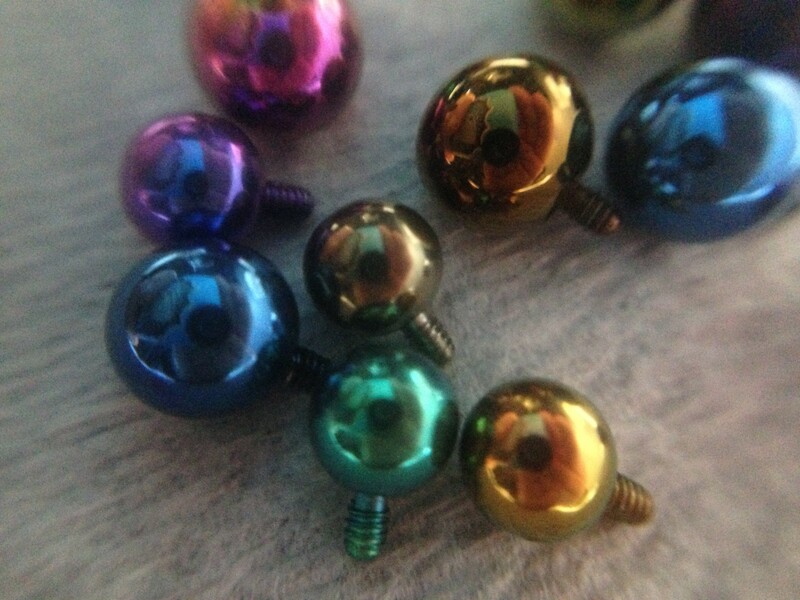 Another very commonly used material in the world of professional body piercing, titanium contains absolutely no nickel; it also has the ability to be anodized, an exciting process in which an electrical current is run through the jewelry and adjusts the oxide levels of titanium’s surface, resulting in the surface of the jewelry changing color without the use of plating or coating! This means that an anodized (or non-anodized) piece of 6Al4V- ELI (Extra Low Interstitials) ASTM F136 Implant Grade Titanium is completely safe for an initial piercing because the color change doesn’t change the properties of the metal. Examples of a few different colors titanium can be anodized. Titanium is also lightweight (40% lighter than surgical stainless steel), which makes it great for plug style jewelry for stretched ears as it won’t weigh the tissue down, stretching it more, but I’ll have to get into that at a later date. That covers most of the basic information for Implant Grade Surgical Stainless Steel and Titanium; I hope I have helped you on the subject. Having knowledge about what you’re putting in your body should be your first concern. In the next installment I will be covering gold, niobium, and glass!